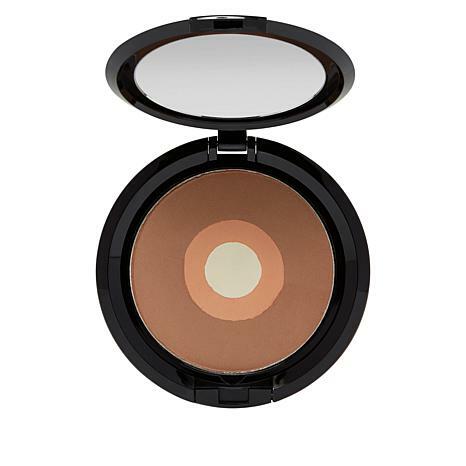 A lightweight, talc-free bronzing setting veil. 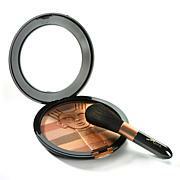 Talc-free, lightweight bronzing powder that is a setting veil, brightens the look of skin and hydrate skin. 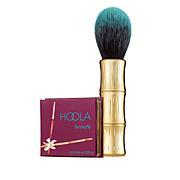 Using your favorite powder brush, blend all three colored rings and lightly dust on top of your favorite foundation, helping to set and extend the wear of your makeup (sold separately). May also be applied alone on bare skin. Ingredients: MICA, ZEA MAYS (CORN) STARCH, DIMETHICONE, ZINC STEARATE, KAOLIN, CETYL DIMETHICONE, ALUMINUM STARCH OCTENYLSUCCINATE, ARGANIA SPINOSA (ARGAN) KERNEL OIL, PHENOXYETHANOL, CAPRYLYL GLYCOL, TOCOPHERYL ACETATE, RETINYL PALMITATE, MAGNESIUM ASCORBYL PHOSPHATE. +/- CI15850:1, CI77491, CI77891.